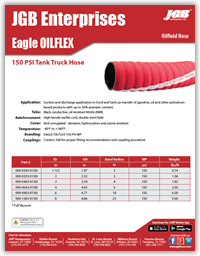 Eagle OILFLEX 150 PSI Tank Truck Hose - JGB Private Brand - Hose by Vendor - JGB Enterprises, Inc. Designed for suction and discharge applications in truck and tank car transfer of gasoline, oil and other petroleum-based products with up to 50% aromatic content. High tensile textile cord, double steel helix. Red corrugated – abrasion, ozone and hydrocarbon resistant.